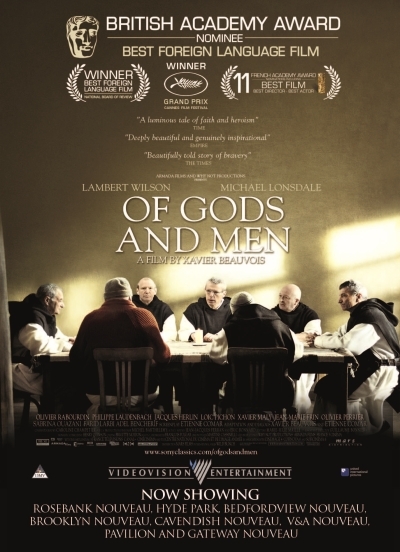 Of Gods and Men tells the story of several French monks who lived in Algeria and were part of the local community there until they were abducted by an Islamist militia in 1996. The monks eventually died under mysterious and controversial circum-stances –— were they killed by their abductors, or were they killed by the army during a botched rescue attempt? — and it is not hard to imagine that most filmmakers would use this story as the premise for some sort of political thriller, full of secrets and cover-ups and a fair bit of action. But director Xavier Beauvois does not dwell on such things; indeed, he brings the movie to a close while the monks are still alive. Instead, he focuses on the monastic life itself and how it prepares these men to face their fate with grace and courage. The monks make and sell honey, and they spend time with their Muslim neighbours, tending to their sick and attending their ceremonies. Most important of all, though, the monks pray. And pray. And pray. Again and again, the film returns to the worship services performed by the monks within their monastery, to the point where some critics have drawn comparisons between this film and Into Great Silence, a recent (and rather challenging) documentary about Catholic monks living in the French Alps. Of Gods and Men isn’t quite as austere as all that, but it certainly pays more attention to the life of prayer than most dramatic films do. And while the film is certainly a portrait of steadfast faith, it also allows for the humanity of its monastic protagonists. In particular, there are moments when Brother Christian (Lambert Wilson), the leader of the group, says or does something rather bold, and you can sense the fear percolating beneath his bravery. But when one of these monks anticipates his fate, he compares himself to the repentant thief who died on the cross, instead. The title, incidentally, is taken from Psalm 82 — a passage Jesus himself quotes in John 10. The Psalm, taken as a whole, is a cry for justice, a protest against the evil committed by the would-be rulers of the world — and a reminder that all of us are God’s children, yet we are also all mere mortals who will one day be judged by God. It’s a fitting basis for a film that is, on the one hand, about the common humanity that links us all, no matter what our religion — and yet, on the other hand, is also about the very specific Christian faith that enables these monks to love both God and their neighbour, even when some of those neighbours wish to do them harm.